Transmission through the bite of an infected Aedes species mosquito. Transmission from mother to child (rarely). A mother already infected with Zika virus near the time of delivery can pass on the virus to her newborn around the time of birth, but this is rare. It is possible that Zika virus could be passed from mother to fetus during pregnancy. There are currently no reports of infants getting Zika virus through breastfeeding. Transmission through infected blood or sexual contact. Spread of the virus through blood transfusion and sexual contact have been reported. Figure 1: Comparisment of Dengue, Zika and Chikungunya transmission routes. You can also download the original image in high resolution as jpg, tiff or powerpoint file. The main transmission route of the Zika virus is via mosquitoes of the genus Aedes, the same vector that transmits dengue or chikungunya (see figure 1). After an infected mosquito bite, disease symptoms usually appear following an incubation period of three to twelve days. The virus is transmitted from human to human by the bites of infected female mosquitoes, primarily Aedes aegypti and Aedes albopictus. 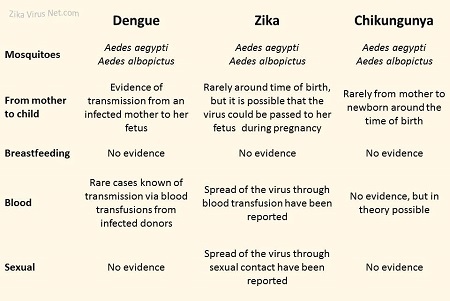 During the first week of infection, Zika virus can be found in the blood and passed from an infected person to another mosquito through mosquito bites. An infected mosquito can then spread the virus to other people. To help prevent others from getting sick, avoid mosquito bites during the first week of illness. There have also been confirmed reports of cases of sexual transmission and of perinatal transmission. In theory, Zika virus could be spread through blood transfusion. There are scientific reports of possible spread of the virus through sexual contact. A mother already infected with Zika virus near the time of delivery can pass on the virus to her newborn around the time of birth, but this is rare. To date, there are no reports of infants getting Zika virus through breastfeeding. Because of the benefits of breastfeeding, mothers are encouraged to breastfeed even in areas where Zika virus is found. Zika virus is transmitted to people primarily through the bite of an infected Aedes species mosquito. These mosquitoes typically lay eggs in and near standing water in things like buckets, bowls, animal dishes, flower pots and vases. They are aggressive daytime biters, prefer to bite people, and live indoors and outdoors near people. Mosquitoes become infected when they feed on a person already infected with the virus. Infected mosquitoes can then spread the virus to other people through bites. The mosquitoes generally acquire the virus while feeding on the blood of an infected person. After virus incubation for eight to ten days, an infected mosquito is capable, during probing and blood feeding, of transmitting the virus for the rest of its life. There is no way to tell if a mosquito is carrying the zika virus. Infected female mosquitoes may also transmit the virus to their offspring by transovarial (via the eggs) transmission, but the role of this in sustaining transmission of the virus to humans has not yet been defined. Infected humans are the main carriers and multipliers of the virus, and serving as a source of the virus for uninfected mosquitoes. The virus circulates in the blood of infected humans for several days, at approximately the same time that they have Zika fever (see also clinical symptoms). Aedes mosquitoes may acquire the virus when they feed on an individual during this period. The Aedes mosquito prefers to breed in water-filled receptacles, usually close to human habitation. They often rest in dark rooms (e.g. in bathrooms and under beds) and breed in small pools that collect in discarded human waste (see figure 2). Although they are most active during daylight hours, biting from dawn to dusk, mosquitoes will feed throughout the day indoors and during overcast weather. Figure 3: Favourite Aedes aegypti breeding pools: junk yards, rain barrels, rain gutters etc.